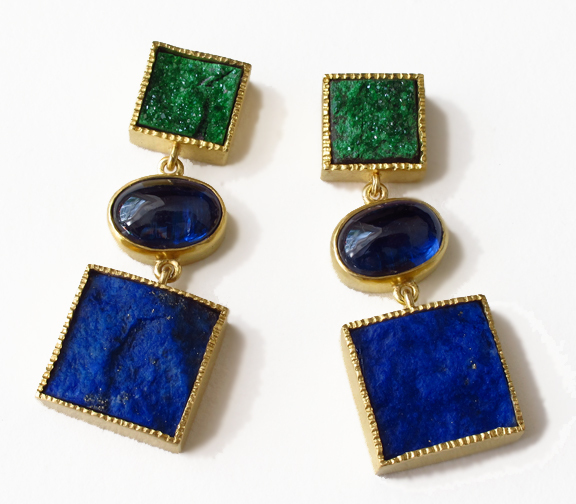 AGTA 2013- Earrings entry by Mimi Favre ©. The American Gem Trade Association sponsors The Spectrum Awards contest to promote the use of colored gemstones in fine jewelry. 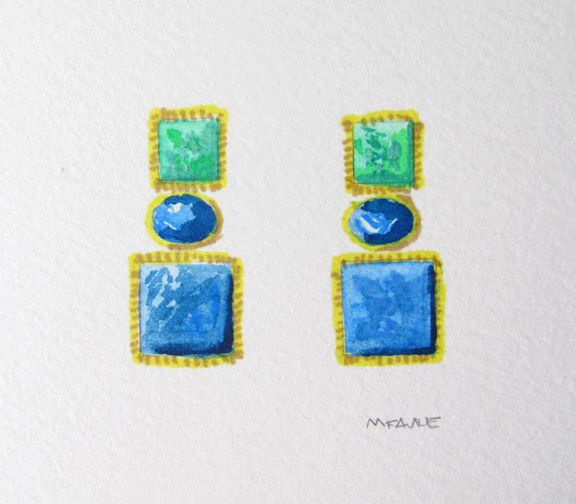 This pair of Color Block Earrings is my entry in the 2013 AGTA Spectrum Competition. The purpose of this contest is to explore and feature the full range of exceptional color found in natural precious and semi-precious gemstones. In recent years many designers have been using less precious if not non-precious stones and minerals and winners have produced less traditional fine jewelry. New manufacturing methods like CAD and laser welding have made it possible to execute pieces that would have been impossible to make twenty years ago. This year there were more than 500 entries. I chose raw Lapis Lazuli and Uvarvoite (green garnet) squares for my AGTA Spectrum entry this year. 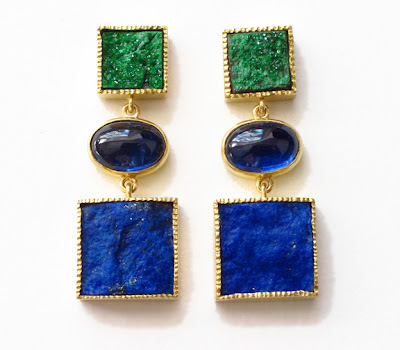 Lapis has been used in jewelry for thousands of years and usually set in pure rich yellow gold. I also used deep cobalt blue Kyanite cabochons. Stones like Lapis go in and out of fashion. Blue and Green was a popular 70's combination that is trending again. I wanted to make a minimal design that is both modern and ancient. 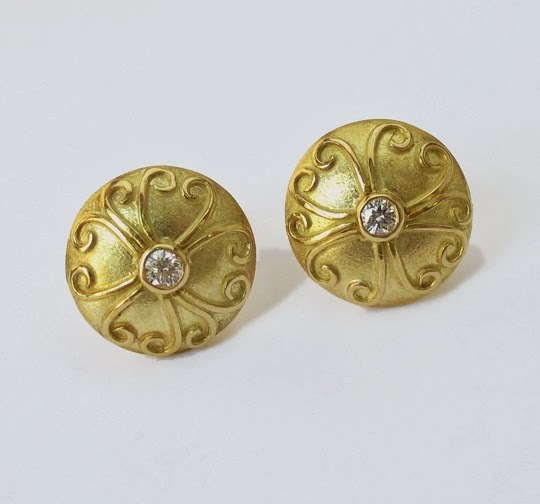 All settings are 22k yellow gold. I set the squares with a thin chasing tool by hand hammering around the bezel. High carat gold is very soft and maleable. 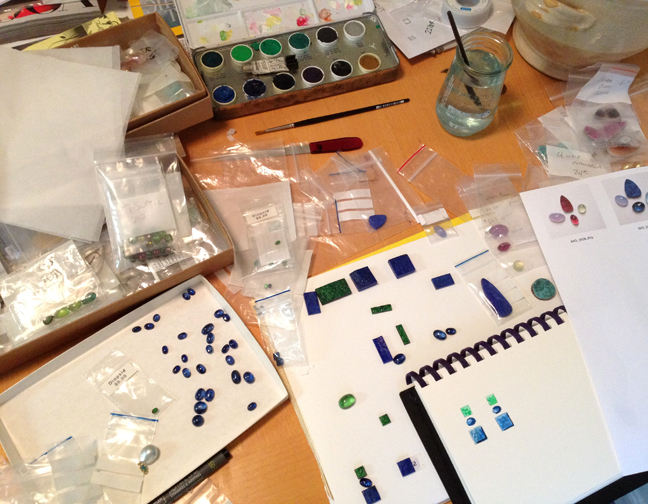 Design for AGTA 2013. Mimi Favre ©2012. Even though I know in my mind how a piece will look, a painted rendering to scale is an important step.